Eight Auspicious Signs by Andy Weber. Note that in this image, the banner occurs in the first position while the precious umbrella occurs in the seventh. 1. Skt. Srivatsa. Rinpoche has not translated this because it is not clear exactly how it should be translated. It is usually referred to as the “unending knot” but this is not the literal meaning of the words. 2. 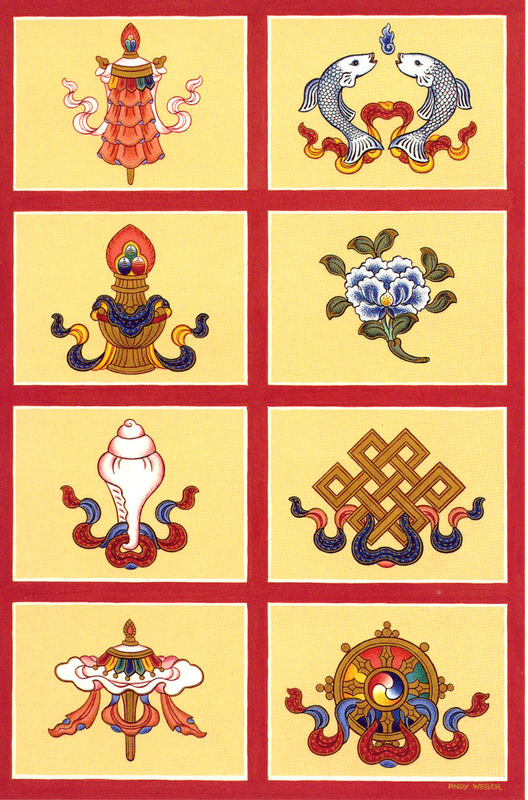 Translated from Gomde Lharampa Geshe Thubten Samdrup’s Dictionary published by Sherig Parkhang, 2005. 3. This is a literal translation of ngän-song sum, which means the three lower realms.